When you get tired of your apple and peanut butter, you need to go gourmet for your snack. This idea is simple. Sugar Snap Peas and WARM goat cheese for a pre-dinner snack to stop the grab for the potato chips. 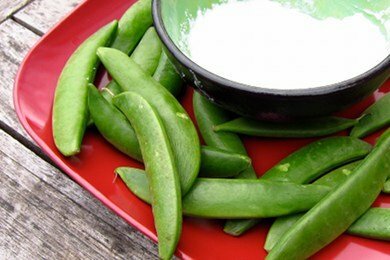 Sugar snap peas have a delicious crunch, take ZERO preparation, and pack 34% of your daily value of Vitamin C in just 10 peas! Goat cheese is just what you think it is - cheese made from goat's milk instead of cow's milk. This cheese is tangy and creamy (and little bit pricey). I bought a 4 ounce package of goat cheese for $4.50 at my local supermarket. The key to eating cheese and keeping trim is not to eat too much of it. One ounce is a perfect serving for goat cheese and because it is strong in its flavor - you really don't want more. How do you get it warm? It is VERY important that you don't heat it for more than 10 seconds in a bowl in your microwave. I did that and it was very sad how my goat cheese separated and turned, well, yucky. Now, you have a creamy dip for your snap peas in a flash and you have avoided sour cream or other higher in fat dips. For my Weight Watchers fans, this snack is only TWO Points+ and you can eat as many snap peas as you want. I also love little pieces of toast with goat cheese spread on it. You heat these up in a toaster over or a broiler for a very short period of time - and you have this dreamy snack. Add it to a salad like croutons, and you can create a meal. Have you tried goat cheese? Please share how you serve it. Goat cheese is really delicious. It's not stinky like a lot of people think. If you've never had it, it's definitely worth a try! The first way I had goat cheese and it's probably my favorite to this day, was lightly breaded and pan fried, served with fresh pears and tomatoes over salad greens with a light balsamic vinaigrette over the top .... A M A Z I N G! I love sprinkling goat cheese ontop of homemade pizza crust with cherry tomatoes and spinach. YUM! Goat cheese is currently my favorite thing...it so yummy with everything. My favorite way to eat is in a salad. I use baby greens or spinach, toasted pine nuts, berries and warm goat cheese. Then I use a small amount of balsamic vinaigrette. This is the best salad ever! My daughter introduced me to goat cheese in San Francisco - served on fresh figs, halved and broiled with a little dollop of goat cheese - amazing! I tried it on plums the same way. Wow, thank you for the great idea, JaneG! That sounds AMAZING. Goat cheese is divine, and these servng suggestions are making my mouth water! @Amy -- that dish sounds delish, and I'm not even that much into salads -- BUT -- you may want to substitute pecans or almonds or pistachios or some other nut for the pine nuts. Some pine nuts can taste fine when you eat them but a day or so after, can warp your sense of taste so that everything you eat tastes like battery acid mixed with soap and dirt -- and this effect can last for weeks. I am not making this up. It's called "Pine Mouth" or "Pine Nut Mouth." It only occurs with some strains of pine nuts, (esp the ones from Asia) and in some people, but you might want to find a sub for pine nuts. Can't be too careful. Bought my second package of 1 oz. cups of goat cheese at Trader Joe's yesterday. The helpful clerk steered me to try it that way last week advising me that if I had opted for a bigger package my first time around it wouldn't keep as long in my fridge. She was right, and I have learned to like it and want to thank you and your readers for the new wonderful ways for me to try it. STILL ENJOYING THE 1 OZ GOAT CHEESE PACKETS FROM T.J.'S. TRY A SMIDGEN OF ORANGE MARMALADE ON TO TOP OFF A HEALTHY CRACKER SPREAD WITH THE CHEESE. i used the soft spreadable goat cheese 2 tbs have about 50 calories and i didn't heat it. it was really good.